Stop Tree Roots in Pipes! Ahoy. My name is Dave Conroy, and my goal is to provide professional plumbing service to our diverse range of clients. 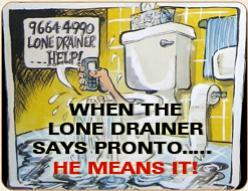 Our parent company The Lone Drainer and Pronto Plumbing services over 3,400 satisfied customers. Many of them have been with us from our humble beginnings in 1989 and for well over 26 years! This website still needs some lippy to make it look pretty, but I said to the boys those damn roots are causing some serious damage to people’s pipes–we have to get the message out there. So if you have roots in the pipes, then you’re in the right place! As a father of three boys, my focus has always been on kids safety. When we come to fix your plumbing we make sure that our solutions are good for the pipes and good for your family. That’s why our “stop tree roots in pipes” solution has been developed to be safe for children, pets, and plants. Only kills tree roots, not trees and plants. Before each application we will examine your pipes using a specialised camera to get to the real cause of the issue. As you can see we take no shortcuts and there’s no guesswork! Alternatively you can contact us via email here. We’re a member of the Master Plumbers and Mechanical Contractors Association of NSW and host trainer for their Apprenticeship Program.